I currently have eight books for sale. In “The GuitArchitect’s Guide to Symmetrical Twelve-Tone Patterns”, Scott Collins has taken the approaches from “Melodic Patterns” and “Guide To Chord Scales” books and applied them to a rigorous examination of twelve-tone patterns that can be used for melodic, harmonic, improvisational or compositional resources. Eschewing a reliance on academic jargon, “Symmetrical Twelve-Tone Patterns” investigates the material in an intuitive and accessible way that will help players access new sounds in their playing. My GuitArchitecture method replaces the standard approach to learning guitar (rote memorization) with a simple, intuitive two-string approach that anyone can learn. This method, where players can actually see scales on a fingerboard, is called sonic visualization, and it can be applied to any scale or modal system. In this volume of his Fretboard Visualization series, I’ve used my two-string method to present the pentatonic minor scale in an easy, intuitive and musical manner. This book not only demonstrates how to “see” the scale all over the fingerboard, but also shows how to use the scale in a variety of contexts and presents strategies that can be applied to making any scale more musical. The Scott Collins Fretboard Visualization Series: The Pentatonic Minor Scale is an invaluable resource for guitarists who are looking to break through to the next level in their playing. In The GuitArchitect’s Guide To Chord Scales, I show you how to make your own scales to use over chords and how to derive chords from whatever crazy scales you come up with in an easy, intuitive and musical way. Over the course of its 190 pages, the Guide To Chord Scales not only offers extensive instruction and approaches, but also acts as a reference book covering chord scale options ranging from three notes right on up to the full twelve note chromatic. In The GuitArchitect’s Guide to Modes: Harmonic Combinatorics, I’ve gone into the nuts and bolts of chord construction and analysis by taking a systematic approach to generating thousands of chord variations that can be utilized intuitively in any key. In The GuitArchitect’s Positional Exploration, I’ve taken an introductory guitar exercise and turned it on its head to reveal deep possibilities in not only in positional visualization, but in technical awareness as well. In this volume of the GuitArchitecture series, The GuitArchitect’s Guide to Modes: Melodic Patterns, I’ve used my two-string visualization method to create a reference book of thousands of melodic variations. With this information, you will be able to create a near infinite number of unique riffs and melodic phrases, which you can use individually or combined to compose or improvise your own music. 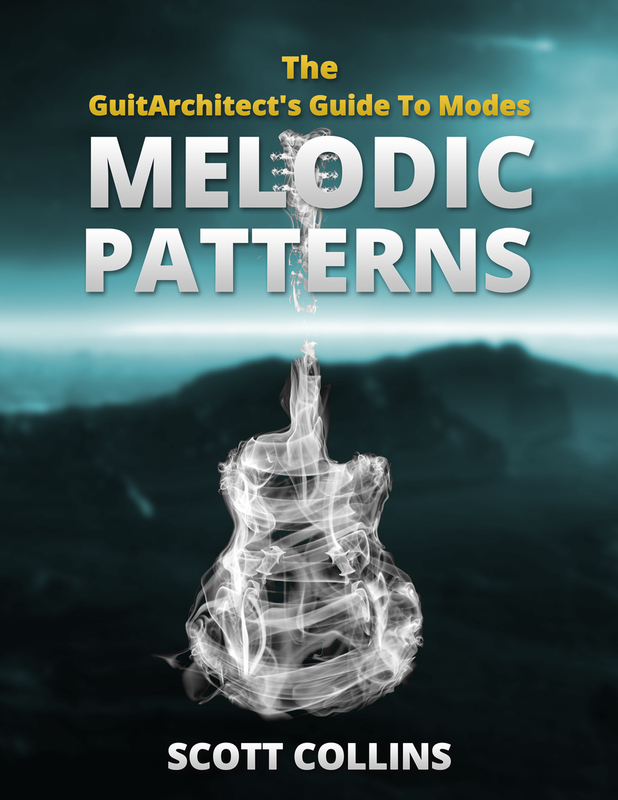 The GuitArchitect’s Guide to Modes: Melodic Patterns is an invaluable compositional and improvisational resource for both guitarists and bassists. “Selling It Versus Selling Out” is an alternative approach to the dusty music business books you’ve seen before. If you’ve ever read a music business article and wondered, “Well that’s interesting, but what does it have to do with me?” – this is the book for you. Spanning 26 essays, “Selling It Versus Selling Out” integrates a music business mindset with a musician’s world-view in a seamless way. It offers music business advice that applies to daily real-word dilemmas faced by working musicians. An Indie Musician Wake Up Call” (Aka What Louis CK, Amanda Palmer, David Lowery and Emily White Really Means For The Working Musician) is a prog rock manifesto delivered as a punk rock intervention. The book is comprised of two related essays that address the real impact that Amanda Palmer’s recent Kickstarter campaign and Louis CK’s crowdfunding release has on working musicians (hint: not much), and the REAL problem musicians face with the David Lowery/Emily White NPR debacle (hint – it’s not strictly file sharing). An Indie Musician Wake Up Call is a rallying cry for real steps musicians will need to take in the 21st century to move forward and establish their careers. And finally, thanks again to everyone who has supported me by purchasing editions of the book! It’s greatly appreciated! Back in 2008, I wanted to write a guitar based book about my sonic visualization process I call GuitArchitecture. My thought was that it would be a combination of instruction and reference and different in scope from anything I had seen (outside of perhaps the Van Epps series). The core of the book (approximately 250 pages) is being excerpted, adapted and serialized on the web (and may be published for people who want an expanded hard copy in 2013). The bulk of the book has been broken down, edited and expanded into a multi-volume that’s been released over 2011-2015. The time line for these is below. All of the following editions are available in print or digital (PDF) form. Several books were released as preliminary editions in 2011, with final editions (i.e. bound copies) released in 2012. The GuitArchitect’s Guide to Chord Scales was the first guitar book completed and released in 2012. The plan is to publish at the leisurely pace of 1 or 2 books a year (between GuitArchitect’s Guide To books and other books) for the next three years. I wasn’t happy with the writing style in the initial book. Additionally, my pedagogical approach shifted from the first draft and I wanted a chance to make the material more accessible. From a promotional standpoint, it made sense to have a lot of free information up to drive traffic to the website. This blog as a place I promote things that I’m working on, plug my releases, performance services/musical gun for hire/ writing services and teaching. In posting material from the book, I can make this the most informative site that I can where people can go to casually check out material and gain information and hip them to – what I believe to be – a really innovative book series that’s different from anything else out there. Still, some people have indicated that they would like a hard copy of the book, so it is very likely that an (expanded) version of the modes book will get released in 2013 or 2014 as well. It looks like the Amazon link is no longer correct. I fixed the link as well, but it’s somewhat irrelevant, as the completely overhauled and revised version of the book will be out in October of this year. I’ll have some posts about it before it goes up, but it’s worth the additional wait.